Based on the Korean reality show Produce 101, Mainland China’s Idol Producer <偶像練習生> aired it first episode last week. Cutting down from almost 2000 applicants, the remaining 100 idol trainees will battle for survival in the 12-episode talent show. Trainees consist of un-signed singers, as well as those who are already signed with entertainment agencies. In the end, viewers will get to vote for nine winners, who will then form a brand new boyband together. 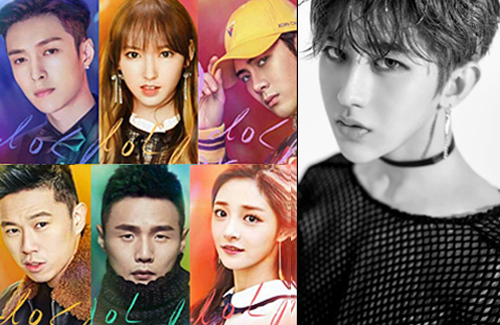 The instructors were split into different categories with Korean band EXO member Lay Zhang Yixing (張藝興) sitting in as the producer, and GOT7’s Jackson Wang (王嘉爾) and Hong Kong artiste MC Jin (歐陽靖) as rap instructors. The dance coaches consist of Korean girl groups PRISTIN’s Kyulkyung (Zhou Jieqiong 周潔瓊), and Cosmic Girls‘ Cheng Xiao (程瀟). Chinese singer and songwriter Li Ronghao (李榮浩) is the vocal instructor. Coaches are Being Too Harsh? Although many viewers tuned in for the first episode, many began noticing that the coaching panel was exceptionally hard on all the contestants. Not wanting viewers to think he was biased, Jackson clarified this issue in a backstage interview, stating that he remains objective regardless of being friends with some of the trainees or not. Another trainee viewers should look out for is August Cai Xukun (蔡徐坤), who was previously selected to join the popular Chinese boyband TFBoys. Since he was only in primary school when he was selected, August gave up this opportunity in order to pursue his studies in the United States. When asked if he had regrets not joining TFBoys years ago, August firmly replied that he had no regrets as he really wanted to continue his studies first. it’s good that they made a boy’s version. they only had the girls version before and i thought that was quite sexist. Of course. Showbiz is tough. Wait till they get into the court of public opinion. It’s a good test of character to see if you can stand it. If you can’t, better leave before you end up in depression and another statistic. Is the black and white photo on the right a boy or a girl? @jjwong That’s a guy named Cai Xukun. He does look feminine. @lej12 o_O I honestly thought he’s a female with short hair. But, the tren gor female is long hair so I second guess myself. So he’s a he after all. Yes, VERY feminine. If you put a wig over him, he totally would pass off 100% no question. Lol. @jjwong Cai Xukun is trying to give a Korean boyband image. Makeup is very strong. His dance was okay, but voice wasn’t too impressive. However his looks may propel him into the final 9. I actually like another contestant, Chen Linong more. He has a better voice and very genuine feel. Although he is not the best looking contestant, he feels more real than some of the more pretentious candidates.